, a celebrated political writer and physician, was born at Cambridge in 1667; and at the age of seventeen admitted a member of that university, where he soon distinguished himself by his uncommon parts and ingenuity. Some time before the revolution, he took the degree of B. A. and after that of M. A. bur, going to London in 1693, and discovering an inclinutioji for the study of physic, he was encouraged in the pursuit of it by sir Thomas Millington, and the most eminent members of the college of physicians. In 1696 he took the degree of doctor in that faculty; and was soon after elected F. R. S. and a fellow of the college of physicians. But whether his own inclination led him, or whether he did it purely to supply | the defects of a fortune, which was not sufficient to enable him to keep a proper equipage as a physician in town, he applied himself to writing for the booksellers. In 1697 he was concerned in the publication of a pamphlet, entitled “Commendatory verses upon the author of prince Arthur and king Arthur.” In 1702 he published in 8vo, “The History of the last Parliament, begun at Westminster Feb. 10, in the twelfth year of king William, A. D. 1700.” This created him some trouble; for the house of lords, thinking it reflected too severely on the memory of king Williau), summoned the author before" them in May 1702, and ordered him to be prosecuted by the attorney-general; who brought him to a trial, at which he was acquitted the year following. In 1704, being dissatisfied with the rejection of the bill to prevent occasional conformity, and with the disgrace of some of his friends who were sticklers for it, he wrote, in concert with Mr. Poley, member of parliament for Ipswich, “The Memorial of the Church of England humbly offered to the consideration of all true lovers of our Church and Constitution,” 8vo. 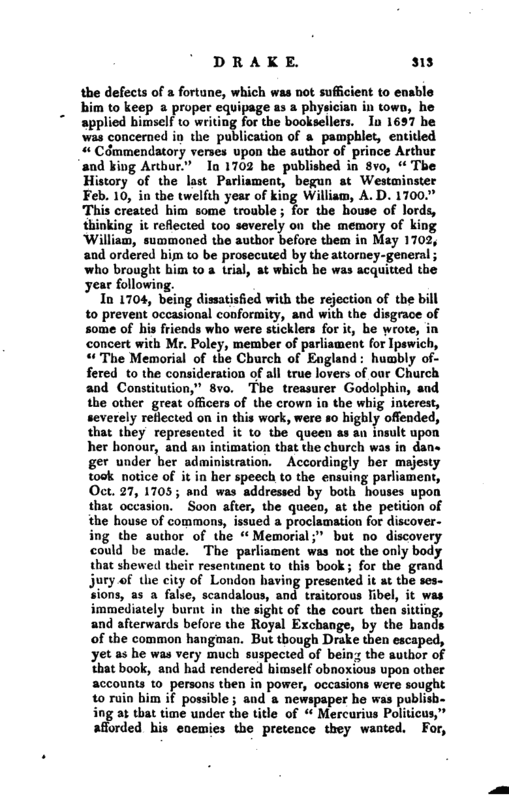 The treasurer Godolphin, and the other great officers of the crown in the whig interest, severely reflected on in this work, were so highly offended, that they represented it to the queen as an insult upon her honour, and an intimation that the church was in danger under her administration. Accordingly her majesty took notice-of it in her speech to the ensuing parliament, Oct. 27, 1705; and was addressed by both houses upon that occasion. Soon after, the queen, at the petition of the house of commons, issued a proclamation for discovering the author of the “Memorial;” but no discovery could be made. The parliament was not the only body that shewed their resentment to this book; for the grand jury of the city of London having presented it at the sessions, as a false, scandalous, and traitorous libel, it wa*s immediately burnt in the sight of the court then sitting, and afterwards before the Royal Exchange, by the hands of the common hangman. 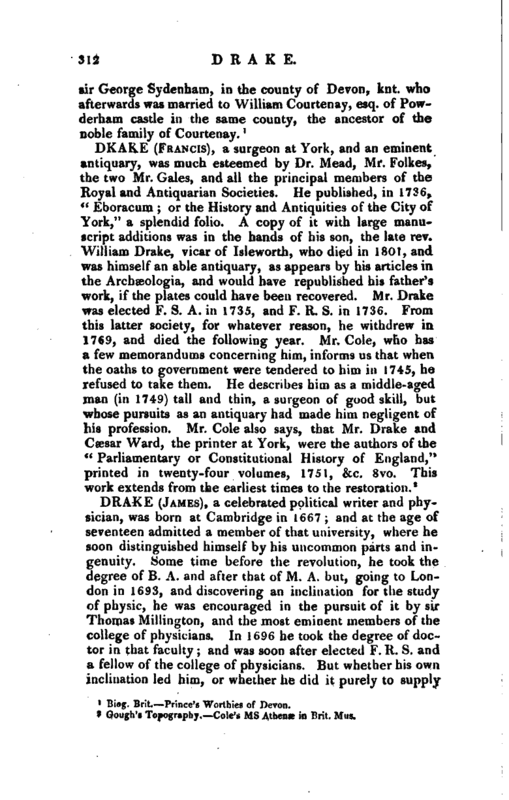 But though Drake then escaped, yet as he was very much suspected of being the author of that book, and had rendered himself obnoxious upon other accounts to persons then in power, occasions were sought to ruin him if possible; and a newspaper he was publishing at that time under the title of “Mercurius Politicus,” afforded his enemies the pretence they wanted. For, | taking exception at some passages in it, they prosecuted him in the queen’s-bench in 1706. His case was argued at the bar of that court, April 30 when, upon a flaw in the information (the simple change of an r for a t, or nor for not) the trial was adjourned, and in November following the doctor was acquitted but the government brought a writ of error. The severity of this prosecution, joined to repeated disappointments and ill-usage from some of his party, is supposed to have flung him into a fever, of which he died at Westminster, March 2, 1707, not without violent exclamations against the rigour of his prosecutors. Besides the performances already mentioned, he made an English translation of Herodotus, which was never published. He wrote a comedy called “The Sham- Lawyer, or the Lucky Extravagant” which was acted at the theatre royal in 1697. It is chiefly borrowed from two of Fletcher’s plays, namely, “The Spanish Curate,” and “Wit without Money.” He was the editor of Historia Anglo-Scotica, 1703, 8vo, which was burnt by the hands of the hangman at Edinburgh: in the dedication he says, that, “upon a diligent revisal, in order, if possible, to discover the name of the author, and the age of his writing, he found, that it was written in, or at least not finished till, the time of king Charles I.” But he says nothing more ol? the ms. nor how it came into his hands. 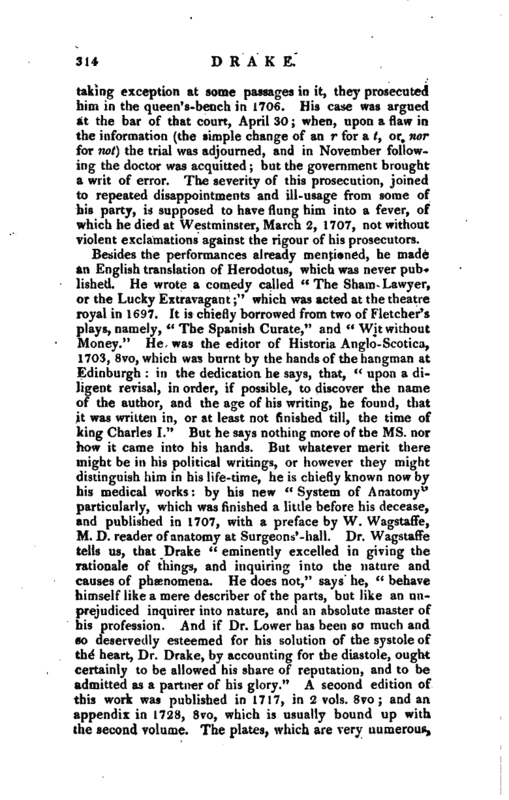 But whatever merit there might be in his political writings, or however they might distinguish him in his life-time, he is chiefly known now by his medical works: by his new “System of Anatomy” particularly, which was finished a little before his decease, and published in 1707, with a preface by W. Wagstaffe, M. D. reader of anatomy at Surgeons’-hall. Dr. Wagstaffe tells us, that Drake “eminently excelled in giving the rationale of tilings, and inquiring into the nature and causes of phsenomena. He does not,” says he, “behave himself like a mere describer of the parts, but like an unprejudiced inquirer into nature, and an absolute master of his profession. And if Dr. Lower has been so much and so deservedly esteemed for his solution of the systole of the heart, Dr. Drake, by accounting for the diastole, ought certainly to be allowed his share of reputation, and to be admitted as a partner of his glory.” A second edition of this work was published in 1717, in 2 vols. 8vo; and an appendix in 1728, 8vo, which is usually bound np with the second volume. The plates, which are very numerous, | are accurately drawn, and well engraved. Some of them are taken from Swammerdam. 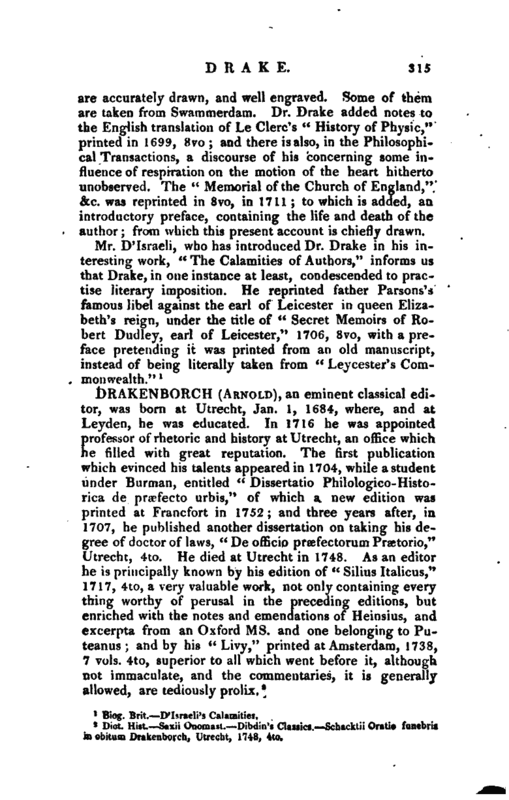 Dr. Drake added notes to the English translation of Le Clerc’s “History of Physic,” printed in 1699, tfvo; and there is also, in the Philosophical Transactions, a discourse of his concerning some influence of respiration on the motion of the heart hitherto unobserved. The “Memorial of the Church of England,” &c. was reprinted in 8vo, in 1711 to which is added, an introductory preface, containing the life and death of the author; from which this present account is chiefly drawn.